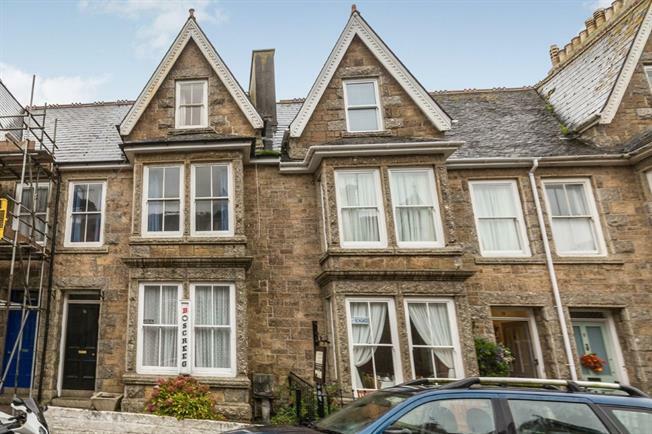 7 Bedroom Terraced House For Sale in Penzance for Asking Price £360,000. This property's price has dropped from £380,000 to Asking Price £360,000. This property which could be a large home or a guest house consists of large living room/diner, breakfast room, kitchen and cloak room. On the first floor you will find three large double bedrooms two with en-suite and a bathroom. On the top floor are four further bedrooms and a shower room. At the rear of this property you will find off street parking and a storage shed. Single glazed wood bay window facing the front. Electric fire and storage heater, carpeted flooring. Single glazed wood window. Standard WC, wash hand basin. Wooden back , opening onto the garden. Single glazed wood window. Single glazed wood bay window. Standard WC, single enclosure shower, semi-pedestal sink. Single glazed wood window. Standard WC, panelled bath. Single glazed wood window. Storage heater, carpeted flooring.